What do John Wayne, Dean Martin, Frank Sinatra, Clint Eastwood, Paul Newman, Gene Wilder, Michael Landon, James Arness and Kenny Rogers have in common? Despite the fees, the security searches, the waits – the hassles – why do we travel? Aside from traveling for business or because of family obligations, there are many reasons to travel. However, with the threats, the delays, the escalating costs, it would sometimes appear that it would just be easier to stay at home. Pleasure is a major factor. Honeymoons come to mind. Vacations are another reason to travel. Go on vacation and see a new culture, country, environment. Even the most fabled, luxurious vacation site has something new to learn, people to meet, experiences to know. Travel can change your life. Example: The current disaster in Haiti is changing many people’s perception of suffering and what other human beings endure. As with Katrina and New Orleans, nothing is ever the same after you have experienced a tragedy of this magnitude. New Orleans is personal to me since I’ve visited there twice – it’s more than just a spot on the map. In more normal circumstances, travel can broaden you – and not just your hips from pigging out on food. New places, faces and spaces can give you a profound respect and understanding of other ways of life. Example: Many years ago, I Iived in Southern Germany. Before I traveled there, I barely had time to get a passport, let alone learn the language, customs and culture. My neighbor in Germany was a Swedish woman who was a very easy-going and well-educated person. Another neighbor I had met, while in the local market, was a native German woman. A custom of our host country was that people only called their close family members by their first names. I was unaware of the custom, so when I met the German neighbor, I asked her first name. Startled at what she perceived as my rudeness, she told me. I could tell that she was uncomfortable, but wasn’t sure why. After all, Americans are very casual, know and use each other’s first names and rarely use last names except in extreme situations of deference. Many people don’t even know someone’s last name. Things never did warm up with my attempted friendship with the German neighbor and I did not find out the reason for many months. My neighbor was offended by my, what she perceived as, unnatural intimacy by using her first name. Moral of the story: Learn about where you’re going to have the best experience. Know major phrases (won’t you want to know where the restroom is and be able to ask that and understand the answer?) I made a point of learning some key phrases and questions. My biggest difficulty? Understanding the answers of those who were kind enough to respond with directions I requested or other answers. So, it didn’t help me that they answered me – for the life of me, I didn’t know what they were telling me – because they didn’t respond with the guidebook’s phrases in the exact words. Other things I learned were the German advanced approach to conservation of energy. They turned off lights they were not using and reused long before recycling became a common thing in the United States. They packed their own groceries at the store. When I returned to the United States, I was changed. I expected to bag my own groceries and had become more aware of all of the waste. Even if you don’t travel to a foreign country, you can learn new things about yourself and those around you. On a snowy trip to my family’s new home in Minnesota, we stopped in a small city in Wisconsin named Eau Claire. It happened to be Christmas Day and the only food we had with us was one loaf of raisin bread. No stores appeared to be open. My family of five was hungry, tired and needed to get off the road. It had been a long day and it was already mid-evening. We found a hotel open that provided food for us, even though the restaurant was officially closed for the evening. We had beds, a place to sleep and a friendly smile from the hotel staffer. That one act of kindness has always predisposed me to have fond memories of Wisconsin. I haven’t been in Wisconsin for years, but I think of the state as a place of kind people. What did I learn? That people can be caring, unselfish and help strangers; That a family can be together and manage, even in tough situations. So, travel. See the world, learn about others – and, even more, about yourself. Next week: Visit the Wild West, some majestic cacti and a B & B with a great view. And, don’t forget to check out our shop where you can buy your own little piece of the scenic places we’ve highlighted. Mexican food is quite available in Arizona, after all, Mexico shares a border. That shared border can be a bone of contention, but if you want a place, no bones about it, that serves “fine Mexican food,” try Eva’s when you’re in the vicinity of Phoenix. 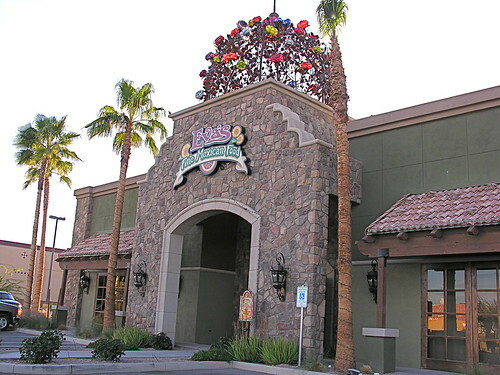 Actually located south of Phoenix off Interstate 10 in Casa Grande, Eva’s Fine Mexican Food has an appealing setting as well as excellent service. This is the second location for the family restaurant. The original opened 25 years ago. Travel Adventures: Why Watch a Whale?